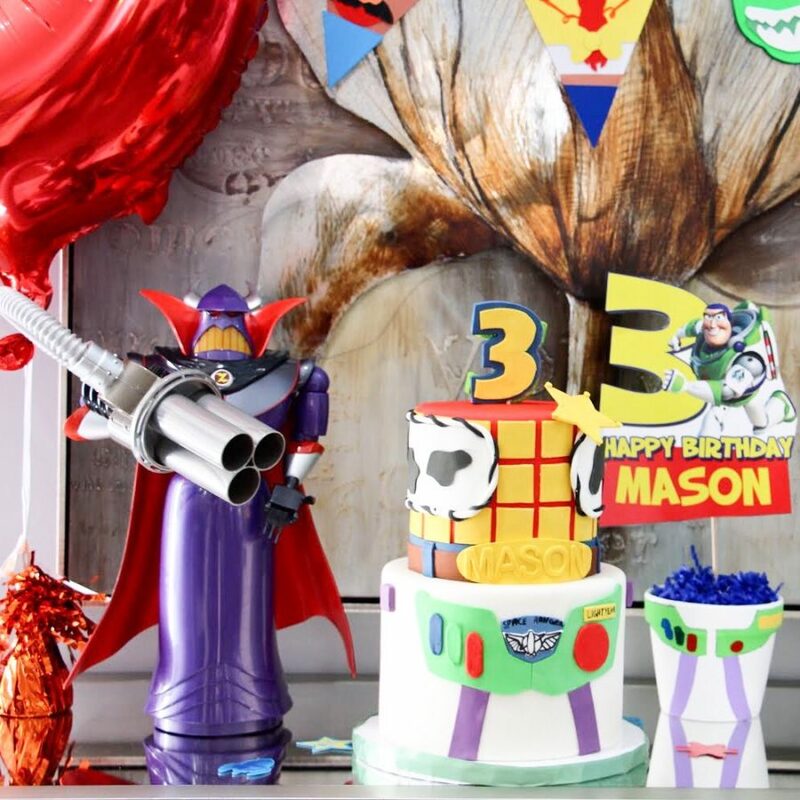 So as most of you know… my Mason turned 3 on Saturday. He is becoming such an amazing man and I can’t help but tear wondering where the heck the time has gone. Another thing most of you know, when it comes to birthdays… DIY is my gig. 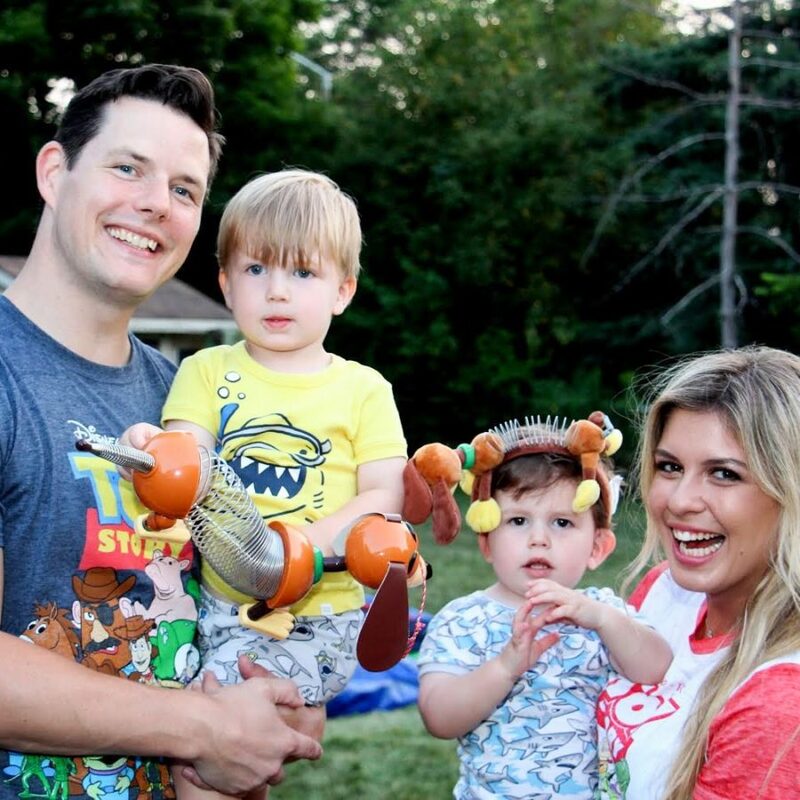 Mason is obsessed with Toy Story, to say the least, so I brought Toy Story Land to HIM! 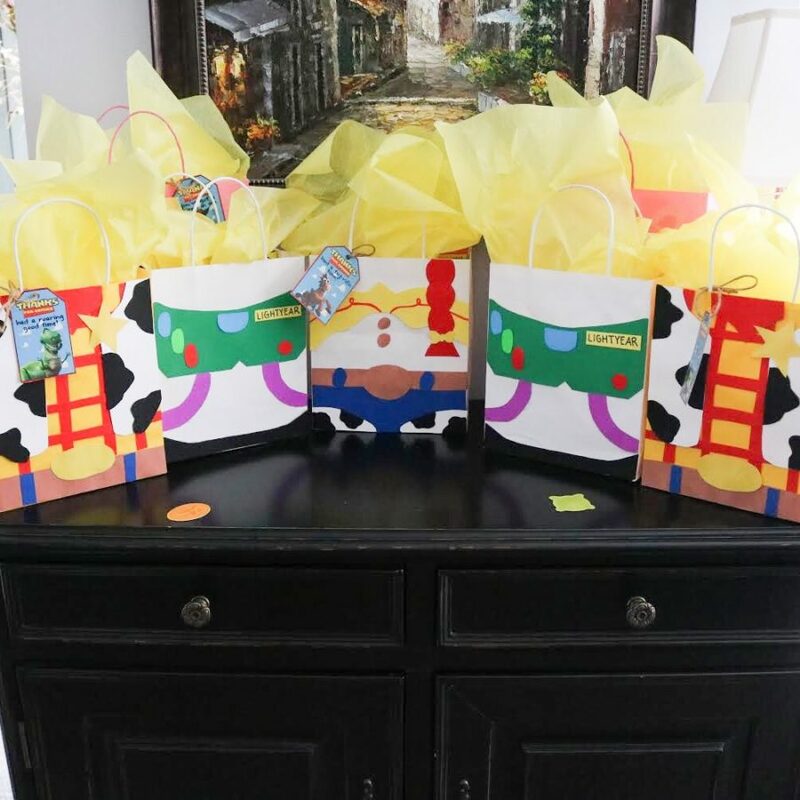 Let’s start with the loot bags. I made them and they definitely weren’t easy, yet totally worth it. I bought the paper bags (2 for .99) and Bristol board and cut and crafted the characters!! Does it take a lot of time, yes, but literally each back look back cost $1 and I was able to add my own touch to them! I got the most perfect loot bag tags from Etsy! When I saw them I knew they would be the perfect finishing touch to the loot bags! Food is very important, obviously. 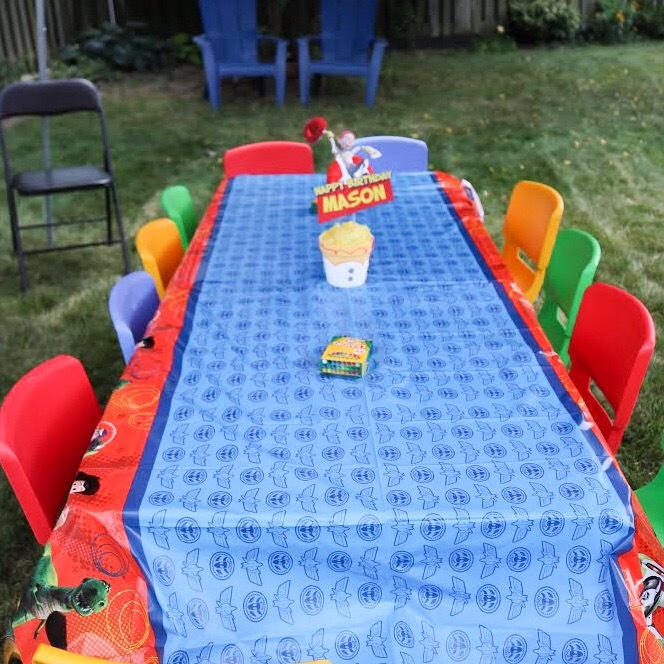 Hey, I mean we were feeding 14 little humans so it was a matter of how to make it fun. 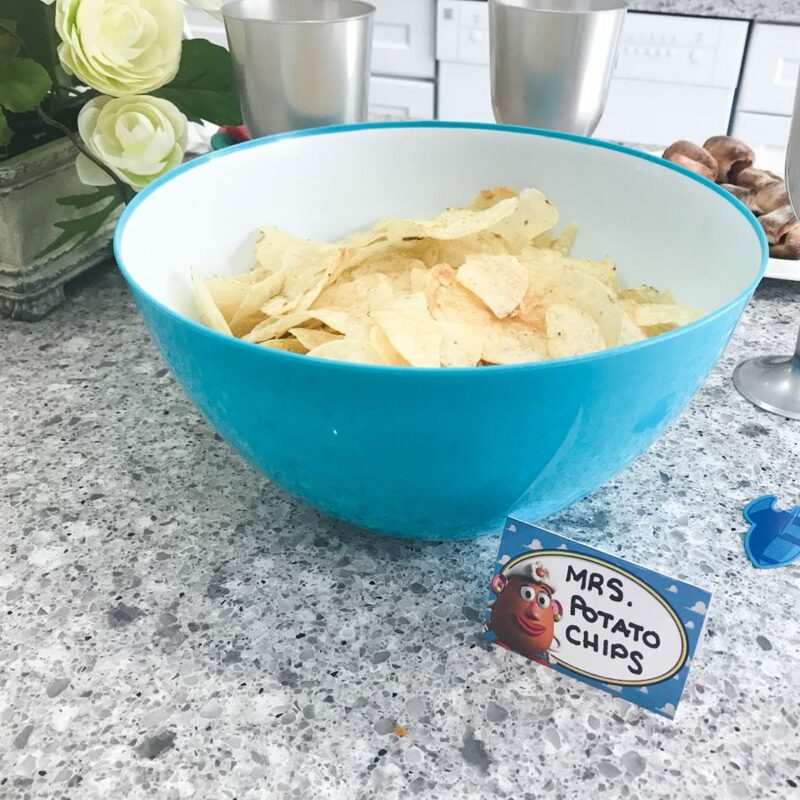 We got the food labels from etsy and added our own touch. Mr. & Mrs. Potato Head Chips, Slinky Dog Pasta, Pizza Planet Pizza and licorice for Buzz Lightyear’s lazers. 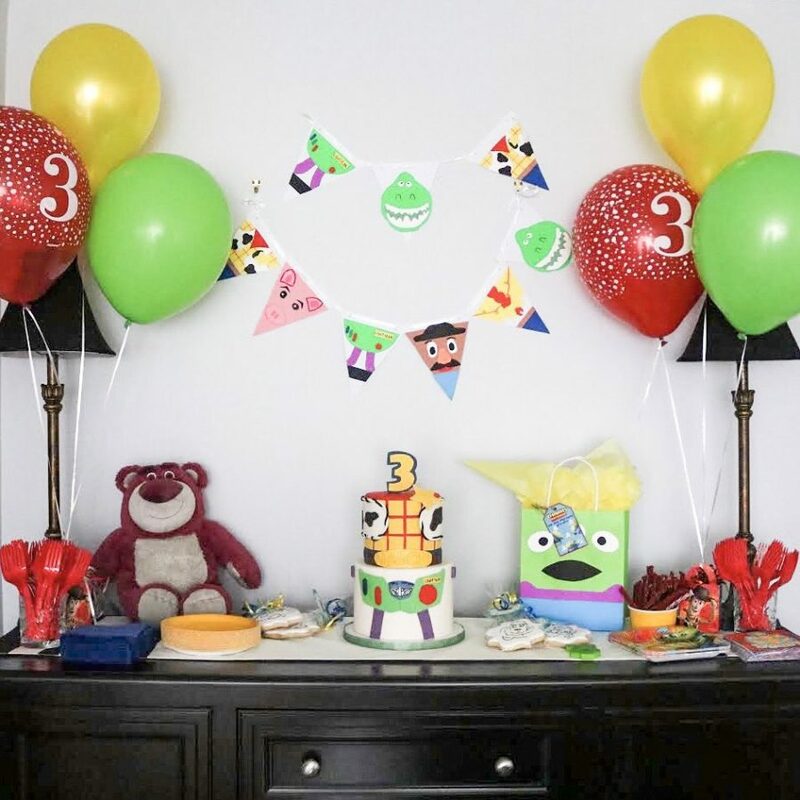 It’s just a way to bring out decor and thought in its own way! We also had a section for “mom juice” which consisted of cans of Truly Spiked and Sparkling Lime Water! It was a HIT! The cake, oh the cake. Mason picked out a photo and we gave it to The Wedding Cake Shoppe. I cannot believe how they brought it to life and people are still raving about the marble flavour. For cakes they’re my go too!! Also, in their bag was personalized colouring sheets and cookies. 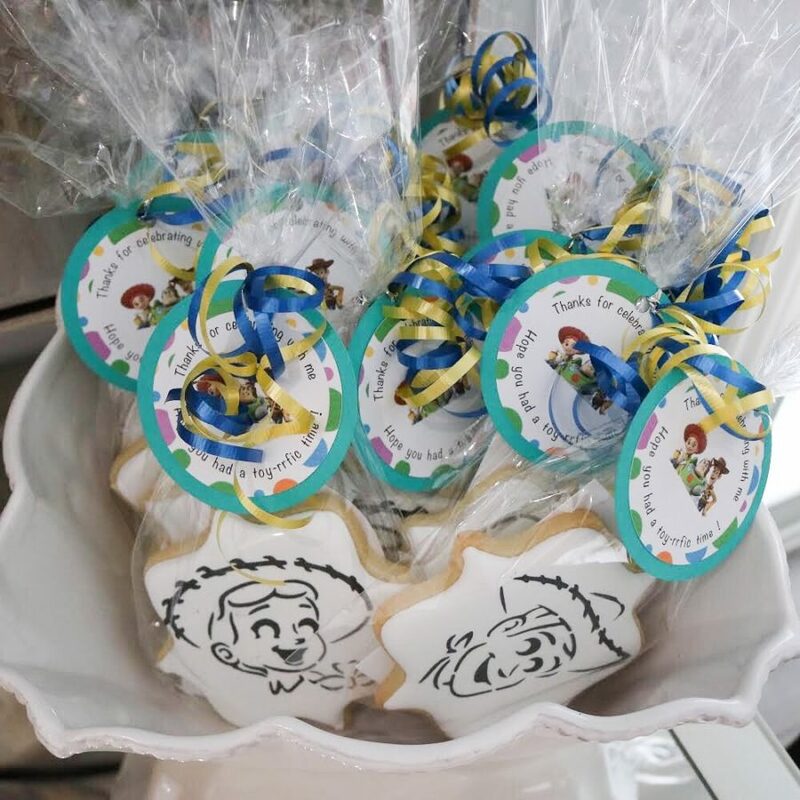 The cookies were all sketches of Jessie, Buzz Lightyear and Woody, BUT on the back are smarties and a paint brush so the kids could also paint their own cookies! 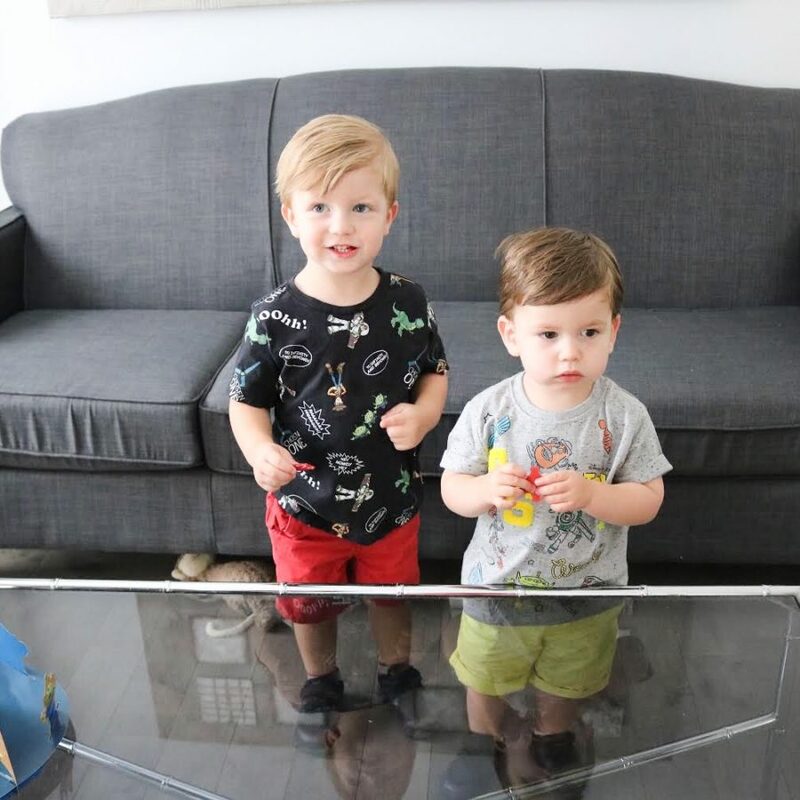 Spinmaster is a HUGE part of our lives, I mean have you seen our house? 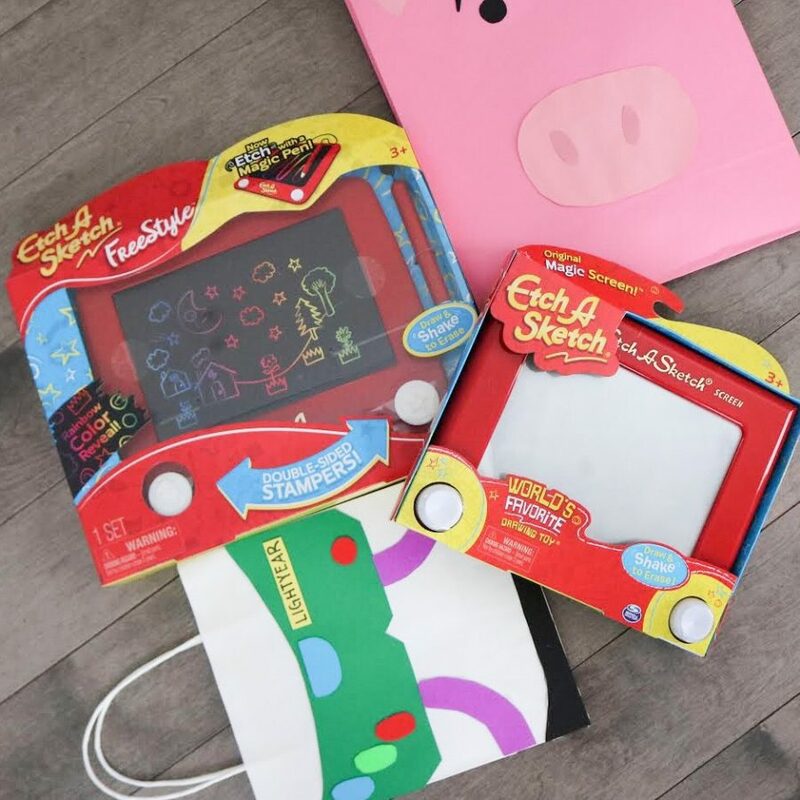 These lucky kids were gifted Etch-A-Sketch. Some old school some new school, and it was perfect because it’s such a big character in Toy Story. Thank you Spinmaster for helping us bring our vision and make it into a reality! Okay, yes I know… a bouncy castle? To be honest, this was Luke’s dad’s vision and it was probably one of the best things to happen to this party. 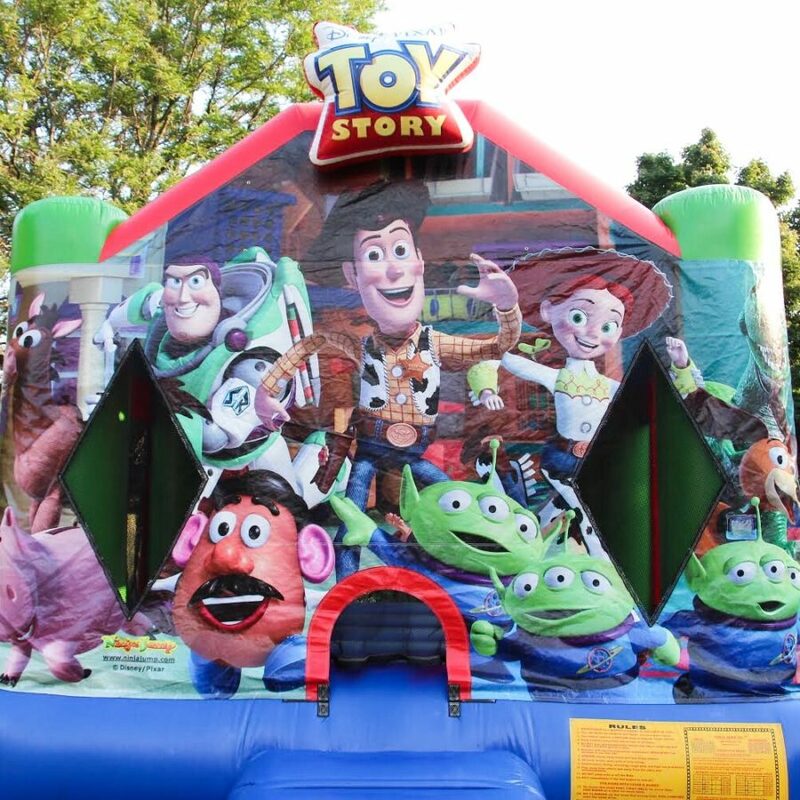 We use Fiesta Rentals to rent our bouncy castle, kids table and chairs! I mean they had a toy-riffic time. 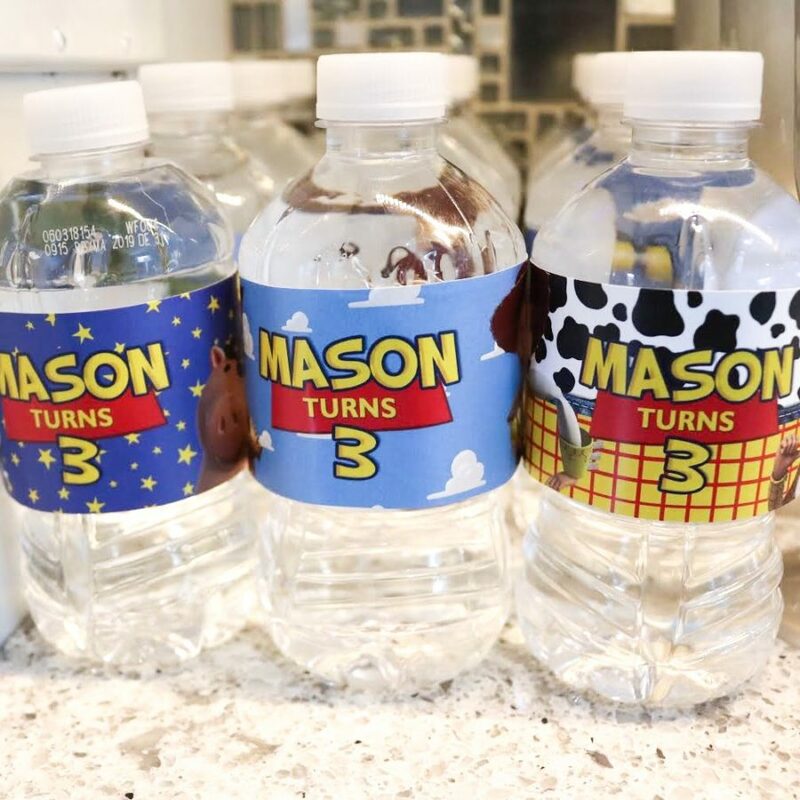 There was personalized touches throughout the party, like personalized water bottles, a poster of mason’s accomplishments at 3 and more! I actually made the banner myself again a DIY project, along with going to the dollar store and painting my own flower pots while getting digital prints from Etsy that I stuck to a styrofoam ball! 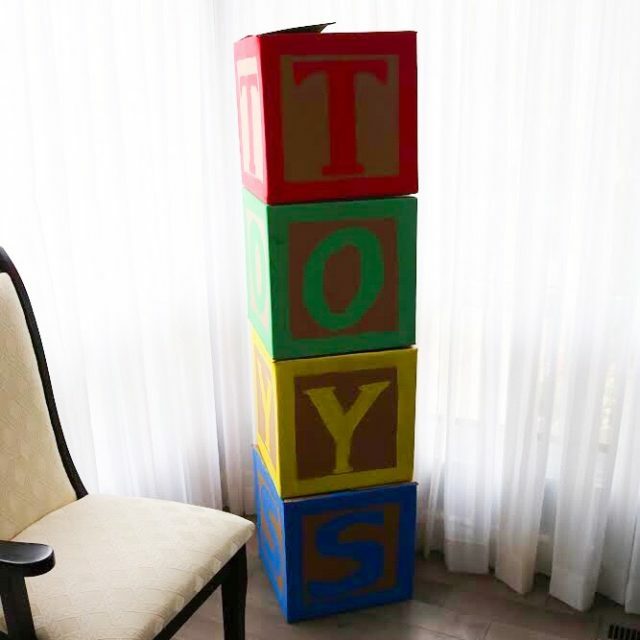 I got plain boxes from Staples which I painted letters to spell ‘Toys’ on like the blocks from the movie and that’s where everyone left their gifts for the birthday boy. Our outfits, I left the fam with no choice I’m not going to lie. 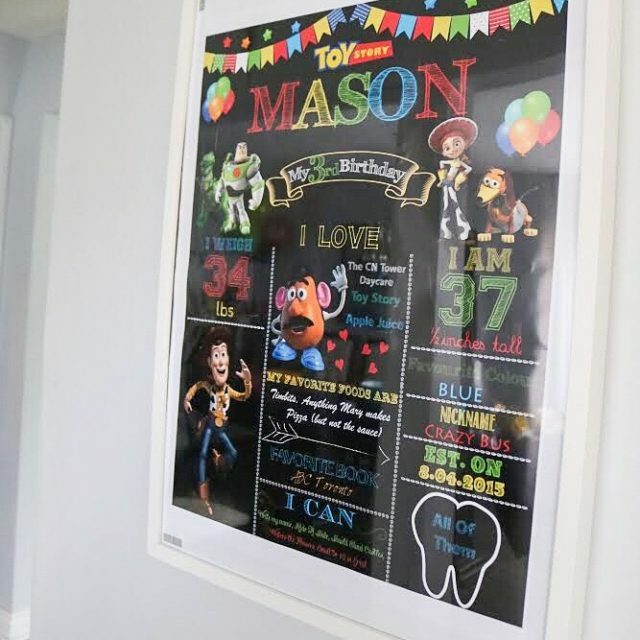 Luke and Asher’s were from amazon.ca and mine and the birthday boy Mason’s was from The Disney Store. The slinky dog headband was on loan from my friend straight from Toy Story Land in Orlando, Florida! 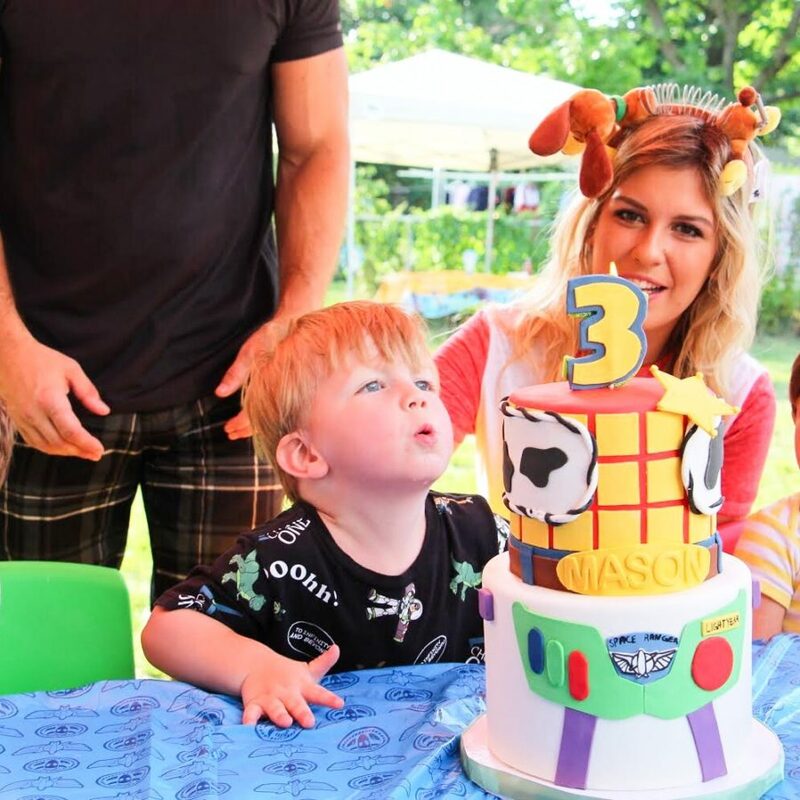 I have to be honest this is his best birthday yet, despite it being a long weekend and the heat, I can’t tell you how spoiled and showered with love my little Mason was. I can’t wait for him to look back in awe seeing how everyone who supports him was there and all the personalized touches that were added to make his day all the more perfect. Mason we love you and at only 3 you don’t know how proud you make us to call you our little man. 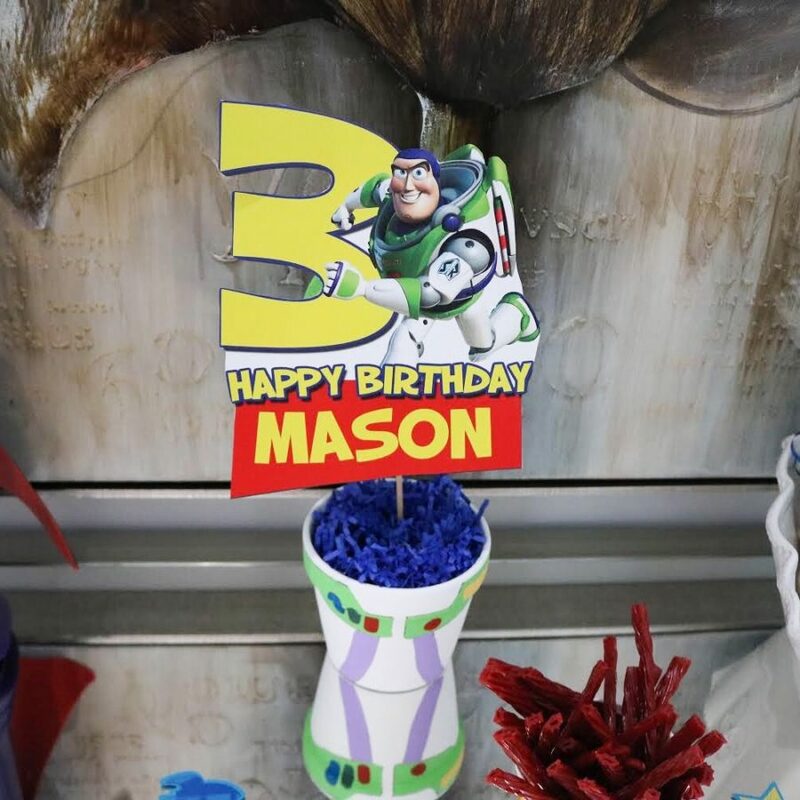 Below is a list of the touches of Mason’s birthday along with all the links, just click the links! 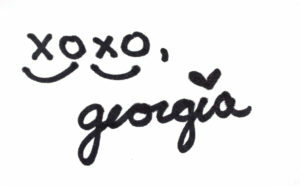 I am sooo happy! You are so amazing. 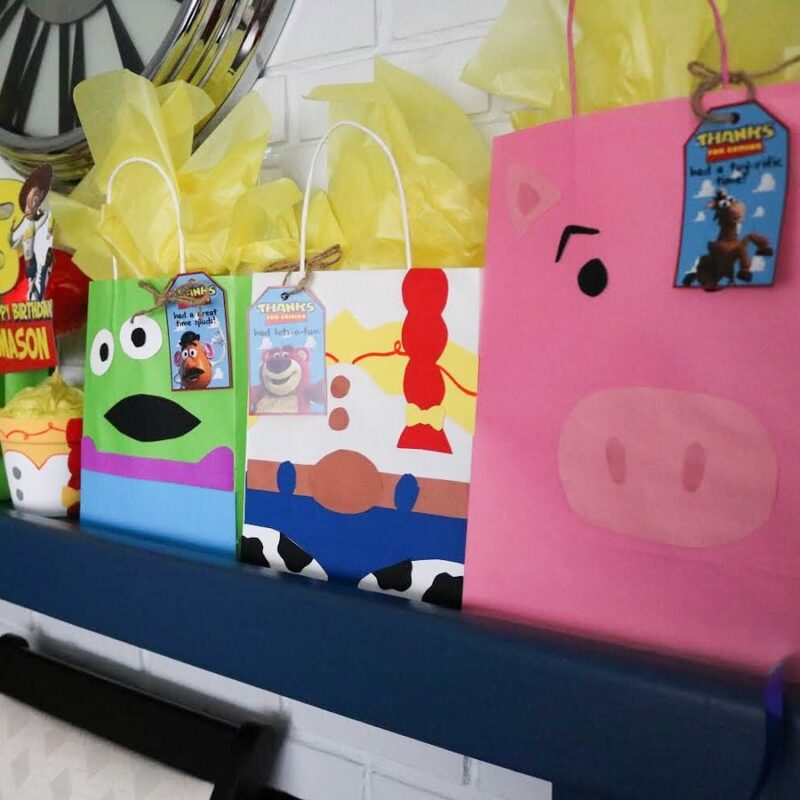 These gift bags are the cutest and most impressive thing I’ve ever seen!!! !